I saw the Stiletto yesterday and thought it was a good name because the boat is sharp on both ends and narrow like a knife that sliced through the water. Painted blue with wood trim, it stands out among the mass-produced powerboats rolled off cookie-cutter assembly lines like so many toys. I saw it again this morning, slipping past me before docking for breakfast. Then it came by a third time and the man inside peered out at me, stood up and really looked, stopped the engine and waved. Sometimes I feel so alone out here. I paddle to far away islands, forgotten coasts, and through swampy mazes where I don’t see footprints for days. Then it makes sense, but there are many ways to feel alone and it is worst in the middle of a city surrounded by people. 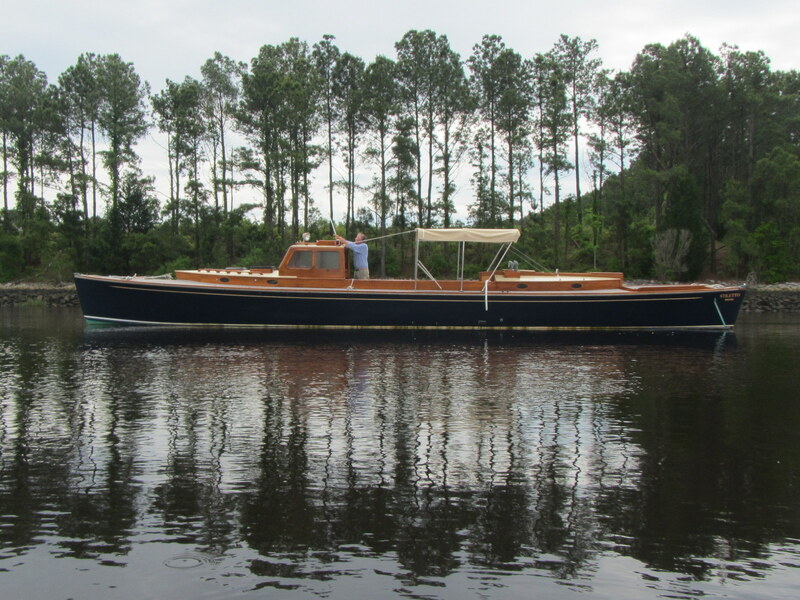 But Halsey stopped and the two of us floated down the Intercoastal with an outgoing tide, talking and trading stories. He said that his grandfather designed the first torpedo boats for the navy, that the Stiletto had the same hull, that he was headed to Bristol, Rhode Island. I told him about handling waves in a kayak and the food I eat and sleeping on the banks. He rummaged through his hold for a minute then leaned over the side of the Stiletto and handed me the a green book wrapped in plastic. I handed him my card and told him he would find my story there. Then we said goodbye near an old swing bridge. And he disappeared down the river, the Stilleto knifing through the water, neither of us feeling quite as alone. Posted in Angle to Key WestTagged Angle to Key West, cool boats, friendly strangers, intercoastal community, stilettoBookmark the permalink. Yet another great story of our humanity. One moment of reaching out has such ripple effects.